Across the continent on April 2 and April 5, the entire ‘68: RULE OF WAR creative team—Jay Fotos, Nat Jones, Mark Kidwell, Jeff Zornow, and Kyle Charles—will be signing and sketching copies of ‘68: RULE OF WAR #1 in celebration of the book’s official release from Image Comics on April 2. This issue marks the beginning of an all-new story arc in the ongoing ’68 series chronicling the rise of the living dead in Vietnam and the late 1960’s. Fans and aspiring comic artists are encouraged to attend and join the zombie festivities at one of the hosting retail locations. Jay Fotos will be signing books at Samurai Comics on April 2nd from 4 p.m. until closing. Stop by the event with an empty stomach and in the mood to mingle, because there will be a food truck and a special “Drink and Draw” session after the event. On April 5, Fotos will be at Fantasy Comics signing books from 12 to 6 p.m. There will also be a special ‘68 photo opportunity for fans interested in attending. Nat Jones and Kyle Charles will be signing at Happy Harbor Comics from 3 p.m. to 6 p.m. on April 2 and at Wizard’s Comics from 12 to 4 p.m. on April 5. Mark Kidwell will be signing books and doing sketches for fans at Collectibles, Etc. South in Richmond Ky on April 2 from 4:30 to 7:30 p.m. and at Collectibles Etc.’s main branch on Locust Hill Drive in Lexington, Ky on April 5 from 1 to 4 p.m.
Jeff Zornow will be signing at Midtown Comics from 6 to 7 p.m. and then at Forbidden Planet from 7:30 p.m. to closing on April 2. 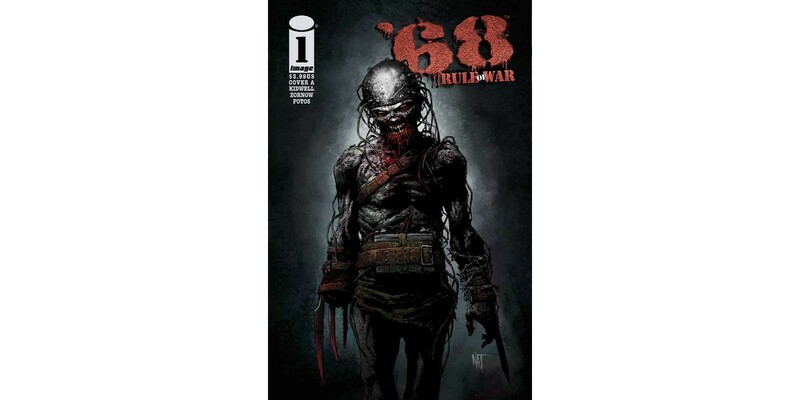 On April 5, he will be signing at Comic Book Jones from 12 to 7 p.m.
Don’t miss out on a chance to meet the ‘68: RULE OF WAR creators, watch them create one-of-a-kind comic collectables and participate in some zombie-loving fun. ‘68: RULE OF WAR #1 hits shelves on April 2. Cover A featuring art by Nat Jones can be ordered with Diamond Code FEB140498. Cover B with art by Clayton Crain can be ordered with Diamond Code FEB140499. The blank sketch variant—perfect if you’re attending one of these events—is available to order with Diamond Code FEB140500.